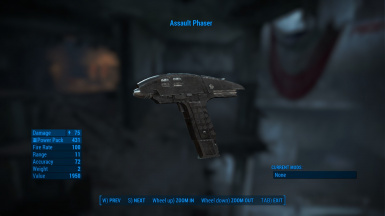 You shot badniks with it in New Vegas and Fallout 3, now the Assault Phaser comes around to waporise the foes of the Commonwealth! Revised how the power setting is handled. Instead of being tied to the magazine, it's now its own separate entry. The setting options can only be applied to the normal phaser; converting it to use fusion cells sacrifices this capability. The phaser can now be set to vaporize, and isn't picky on what it vaporizes. The stun effect has also been reworked and now ragdolls the target rather than paralyzing them. 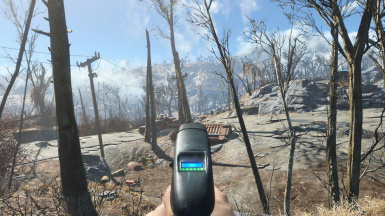 The stun packs have been replace with Overcharged packs, which provide an increase in damage and ammo capacity. 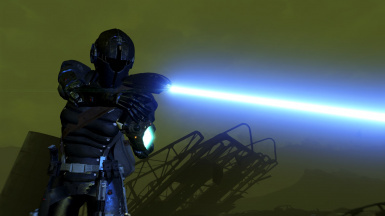 As an upgrade you can also make Supercharged packs, which offer even more damage and ammo capacity. Added a new receiver option, the A.I. 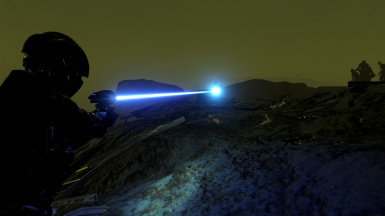 Targeting Module, which enables the phaser to fire target-seeking shots. The converted receiver can't has this, however. 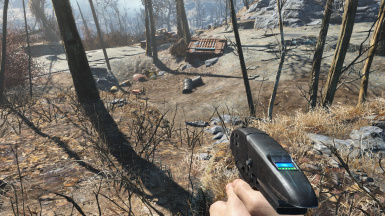 The phaser can now be set to be automatic, meaning in its normal configuration you can fire a steady stream. In its converted form it's a more typical automatic. Revised the specular texture for the clean material, and re-saved the diffuse texture in BC7 format to reduce compression artifacts. Changed the cubemap used by both the clean and weathered materials. Replaced the note in Advanced Systems with a holotape. The note hasn't been deleted so if you already picked it up, you'll still have it. The holotape isn't too much different, but there's some added stuff that might be interesting. 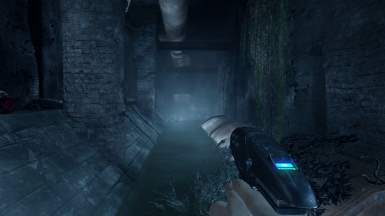 Textures have tweaked a bit and re-saved into a more compressed format. 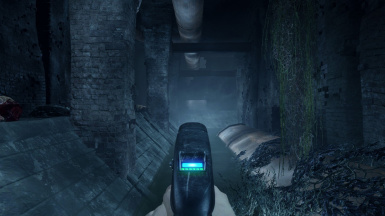 Normals have also been revised, correcting a shading issue on the phaser's grip. 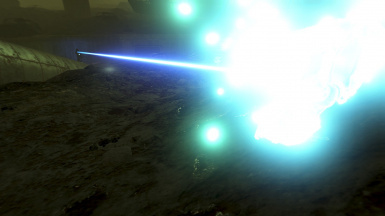 Changed the phaser's impact effect, so it now no longer uses the bullet impact, instead using an appropriate energy impact. 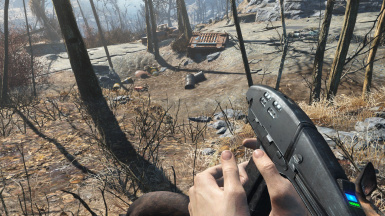 The phaser's magazine now properly ejects and reloads. Added a holosight so the phaser can be properly aimed. With the magazine fixed now, a couple mods have been added for it: A quick eject mag and the arrival of the Stun packs, both standard and quick eject. The Stun packs will reduce the damage a fair bit, on top of allowing you to stun your foes, but the phaser still has the potential to be lethal. Adjusted the firing sound for the converted phaser. Tweaked damage reduction for the converted phaser, and other small adjustments. Adjusted the converted receiver so it properly halves the ammo capacity (so you have 50 shots instead of 100), rather than adding 50 to it. This was how it was supposed to work from the start, but I didn't bother fixing it until now due to it being a minor issue. 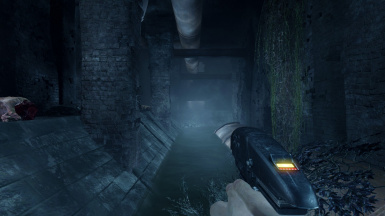 Adjusted the sound mapping so the firing sound(s) will occur if followers use the weapon. Reworked the crafting recipe for the power packs. They're now made at a chem station, under Utility. Science 3 or higher is needed to make 'em. Fixed the critically poor range the phaser had. Added the phaser's ammo to the fusion cell level list, so it should turn up periodically in loot, until I work out how to make it craftable. Corrected (hopefully) the accuracy issue folk were having with the phaser. "I didn't want them to be squirt guns. I wanted them to be .45s." Big, black and intimidating, the Assault Phaser was first seen in Star Trek V: The Final Frontier and returned in Star Trek VI: The Undiscovered Country. Made to look like an actual gun instead of a flouncy plastic toy, this beast will make anyone you point it at wish they brought their brown pants. 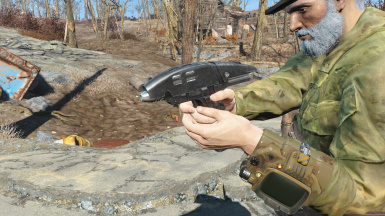 Carried over from my New Vegas and Fallout 3 editions, the Commonwealth Assault Phaser comes with custom sounds, both equipping and firing. 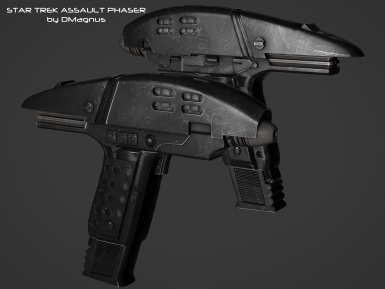 While unchanged in appearance (save for some minor texture tweaking) the phaser deals a base 75 in both physical and energy damage (reason being that the phaser is shown to actually CAUSE physical trauma, namely shooting off limbs) and, while it uses power packs as its previous incarnations have, it can now be modded to use fusion cells, at a slight cost in damage and a decrease in magazine size. 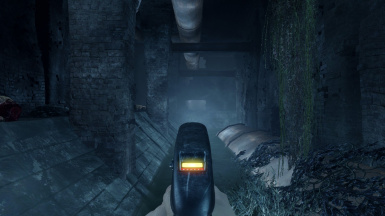 The phaser's firing sound will also change when in its converted form, and the lights on the back change to provide a visual cue for the change as well. 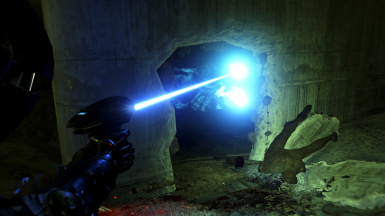 The phaser can be found in the Institute's Advanced Systems lab, at the firing range. 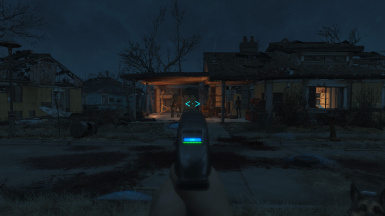 From 1.1 onward a second phaser can be found in Virgil's lab in the Glowing Sea, in case you wants 2 or if you've done things that mean the first one is unobtainable. > Add more modifications. 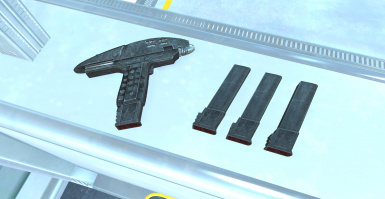 I intend to make it so you can turn the phaser into the assassin's rifle that went unused in The Undiscovered Country, this means a scope, stock and barrel will be able to be attached, on top of the fusion conversion. > Custom animations. 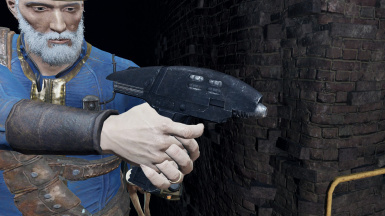 Right now the phaser uses the 10mm pistol animations, so it will be affected by any mods that replace the 10mm animations. 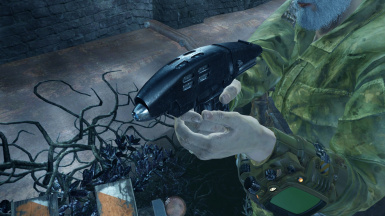 > A separate, weaker variant used by Institute Synths, based off this design. Report any bugs ya find to the bug tracker, or comment if you prefer. Once you download the update, extract the file to your Data folder. When prompted to overwrite, allow the file(s) to overwrite the original(s).